Make a Upgrade with X amount of levels. Make it cost more on Each Level. Make it Queue Once on the Upgrade Menu. Step 3. 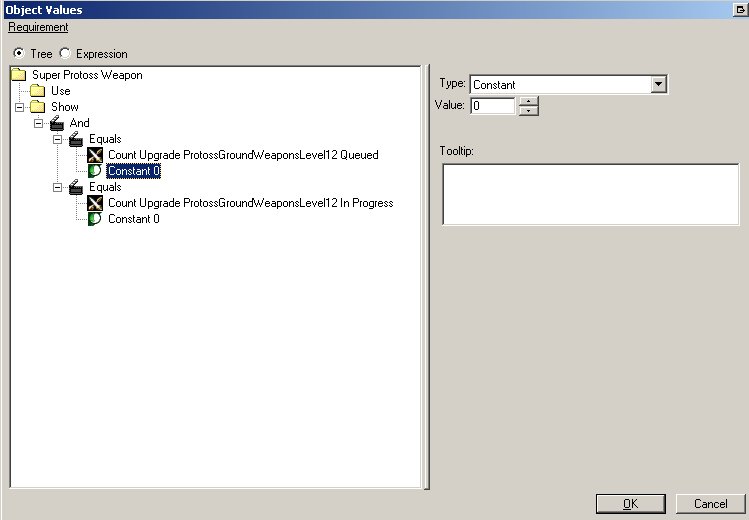 Duplicate a Upgrade of similar function you want to achieve. The next window will pop up what units I should duplicate It may or may not list any, but it will list the "parent" or original upgrade's unit. I will start from scratch and not duplicate any. Step 4. After that, change the Max Level of the Upgrade. This will allow you how many time you may repeatably upgrade this upgrade. Remember that tab where you scrolled for the Upgrade. This time hit the Data Source to "Buttons"
Just make a new button or duplicate one. Now you have a Button! Requirement is not a necessary step but it stops the upgrade from multiqueueing. Multiqueueing may cause unwanted gameplay concepts particularly to the player's economy and time. Make a new Requirement with a similiar name to your upgrade. Make a "And" requirement Node. Under "both" Equal Node, put two more nodes. Under "both" Equal Node, make one node a Constant with a value of 0. Under "both" Equal Node, make one node a CountUpgrade. Make One CountUpgrade with an State of "Queue", and the other "In Progress"
In your ability tab we are going to be editing the Research ability. Each building with a research has its own ability to research. Once you are in here. Pick your "custom button" or existing button that this Command/Research will be. Next, if you have a "requirement"
Stick in the State to be Restrictive, and select your requirement that you previous created. Next edit in the value such as how much will it cost, time it will research in ETC. But make sure, AT THE BOTTOM, put your "Upgrade" there. Then push Okay, and you should be good to go. 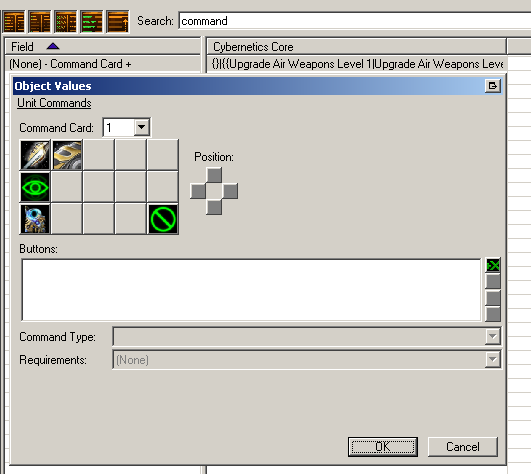 Make the Command Type to "Ability Command"
The Ability COmmand "Your Upgrade"
Holy Crap we are done! Go back to where you first created the upgrade. Remember where you edited the Max Level? Instead of the Max Level Field we will be editing. We will be editing the "Effect+" field. This is the JUICY PART! This may be complicated but, it actually makes sense if you read a little bit into it. This is where all the damage, armor, and other interesting stuff are affected once you research the upgrade. But there is one missing thing here, which is "accumulative cost". Righ click on the top part of the window. What Object will it affect? Well of course, The "Cybernetic Core - Research" ability. What Slot will it affect? You know which one, the slot you chose! But, what I want to do is add 100 Mineral each time this upgrade is researched. Thus accumulating 100 mineral more each time I research. Just remember though, the operation is important. Add will add on to the current amount. Intial cost is 0 at the moment. At level 0, it will cost 0. At level 1, it will be 100, level 2 will be 200. Level 3 - 300, Level 4 - 400 and So on. If I were to multiply it with a intial cost of 100, it will be, Level 0 100, Level 1, 200, Level 2 - 400, and Level 3 - 800. And there is your Upgrade! The upgrade doesn't show up in the upgrade drop down box (Right before the "Connect everything" section in the walkthrough). Anyone have any idea why it doesn't? Ok... I can't get custom upgrades to work at all. 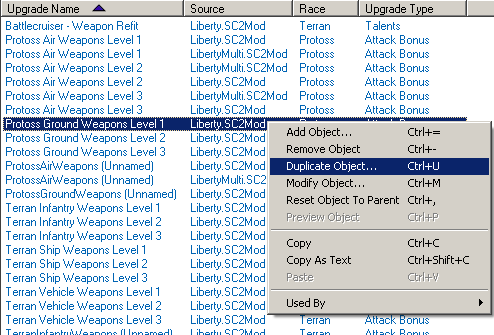 Here's what I'm doing, 1) duplicate terran infantry upgrade. 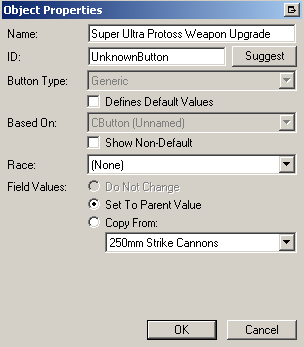 2) Set max level of the copy to 255 3) set the engineering bay ability to use the copy. Then I test it and the upgrade does nothing. OK, in testing there are a couple things stated incorrectly in this guide. The Type should be Ability not Effect. Also in testing for some reason I cannot get to this to work if I have my Max Level set to higher that 127 under the Upgrade itself. I noticed that was wrong as well, but I figured that one out. 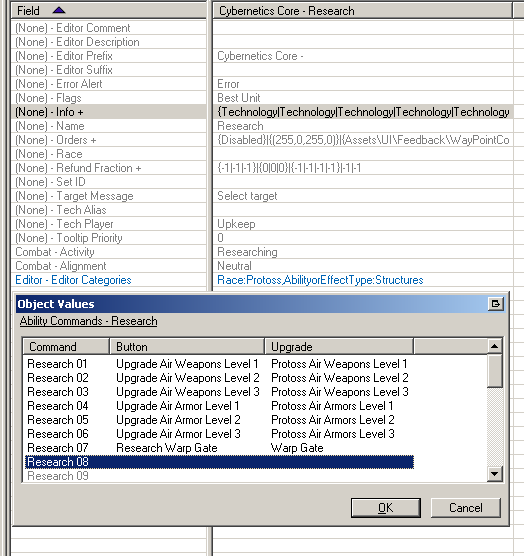 When I'm in the "Cybernetic Core - Research" and I try to add the new upgrade to the "info+" field, the new upgrade doesn't show up. Not sure why it isn't showing up for you. I duplicated your Bunker Upgrade (minus the Effects since I don't know what those are) and then went to the "Engineering Bay - Research (Engineering Bay)" Ability, added a new Research item, went down to the bottom under "Upgrade" and it appeared right in the list for me. Great tutorial, works perfectly, except for one thing. 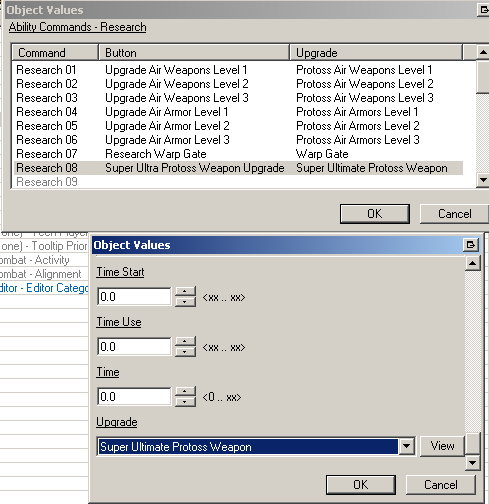 Setting the max number of upgrades to 5 in the Upgrade data type works fine, it will only go up five times. 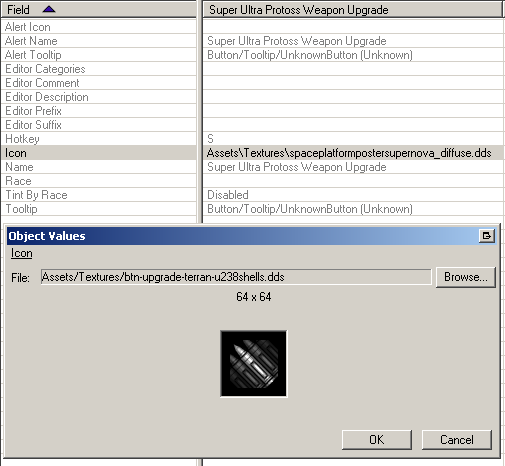 However, the button to perform the upgrade remains, allowing me to consume additional resources to perform a sixth upgrade, and when it's done the upgrade will remain at level 5 (which is good). How can I make that button go away once the upgrade is at level 5? I suppose I could use a Requirement, but that's ugly and I'd rather it just dissapear. Edit: Problem solved. I was a) putting the requirement nodes under "Use" instead of "Show", which resulted in the ugly error, and b) I added a requirement node to check and see if the upgrade was completed 4 or less times. You should edit and mention these two things. 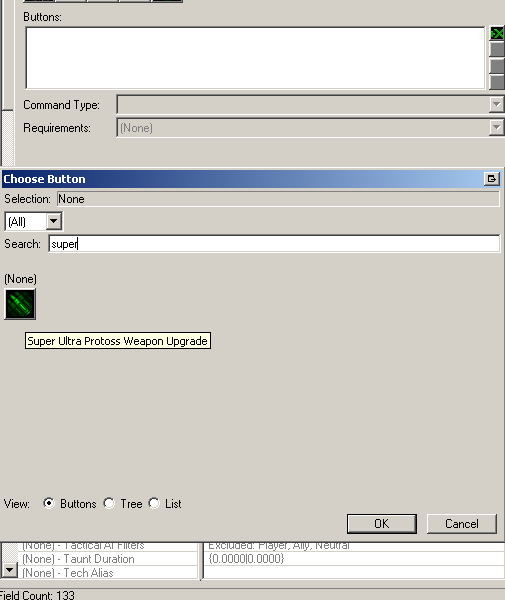 I used this tutorial to set an upgrade up, and it worked, only I can't edit that upgrade anymore - if I go to the upgrade tab and select it the editor freezes up. Great post. One question though. How do I just limit the upgrade to the one turret as opposed to the upgrade hitting all my turrets when i research it? If you get upset at losing in a game, you have yet to win at life. I would love to know this too. I too am trying to get Upgrades that only affect a single Unit, like the Turrets in Overrun! for example. I want to be able ot upgrade each of my units seperatly. Ok I got it working strictly in the data editor. So far I've done it with 2 kinds of towers with 5 upgardes each. Tower A and Tower B. All origonal units, actors, effects, weapons, abilities, buttons was made from scratch. I did not dublicate anything to make my funcional towers/builder. I hate all the duplication tutorial video's out there. It's really a shame because it's much easier and much less a headache just making new everything instead. So I have my Tower A, it can be upgraded 5 times. Each time increases it's damage and the Final upgrade increases damage, range, speed, and it's effects. and it works great after some learning pains. (obviously you can name it however you want). I'm really against duplicating, but if you are duplicating your own creations, you know exactly what was in there, so there's no headache. Duplicating tips - When I had to dublicate my towers. I did it without the attachements. Meaning when I did Units, I didn't have anything checked but the main unit. All effects, weapons, abilities actors, etc.. was not checked. I just went into actors after and duplicated the actors I needed without having anything checked. ok.. now that we have all our stuff duplicated. 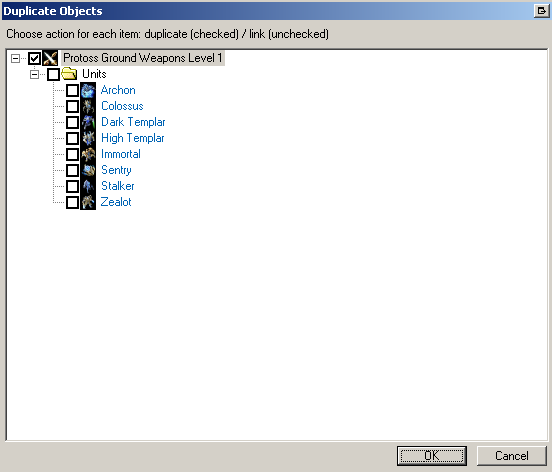 (UNIT - ACTORS (2 kinds - Action(weapons) and Unit(tower model)) - BUTTONS - WEAPON - EFFECTS (2 kinds - Launch and Damage (I really like projectiles in TD games)) One thing you do not need to duplicate is your projectile UNIT unless you want a different kind for the upgrades. You can change the effects in the ACTOR (Action) without changing anything else to make your newly upgraded towers look, sound and feel different from their previous iterations. 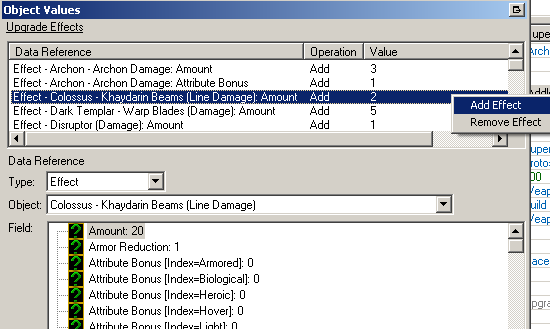 Now the only thing you need to do before you start fixing the few damage/range/speed values and linking the units to the duplicated effects/weapons/buttons is make morph abilities for each upgrade. 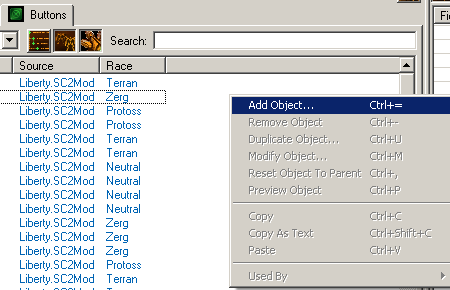 Under abilities create a new morph ability, you only need to input 4 fields here. 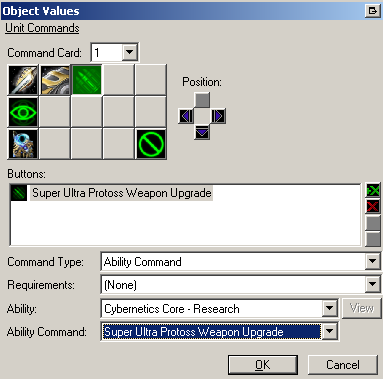 Ability Command +, -- sets up your button, pretty straight forward. Costs + - how much the upgrade costs. (UNIT TAB) Ability - Abilities + - give your unit the new upgrade tower ability (morph) Ability - Command Card + - set up your button. If you followed the order in doing everything in the way I wrote it here, you shouldn't have any problems if you have a decent working knowledge of linking all your stuff properly. This little instruction set should work fine. In my map (Overrun!!) I have the turrets working like this, like you said. Took me a while to figure out the best way to do it. 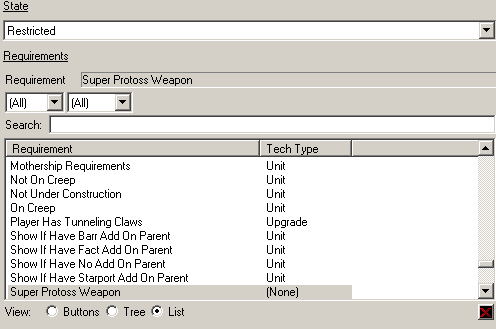 Basically I have 12 Abilities for each type of turret (4 types of upgrades and 3 levels for each). The ability runs an effect that applies a behavior to the turret, increasing its stats. How do you set behaviors into this? I basically have 1 ability per tower ugprade and don't see the benifit of attatching a buff behavior. Ive read from various places that for upgrading single units to use behaviors, but when setting it up, my turrets just turned into unclickable, non-shooting modeless white balls. this guide fails in the new editor now, it bugs up when i use the upgrade. it also shows the cancel icon trying to learn not the upgrade itself. i fixed it once but it reverted itself back so the editer can make changes without u knowing about it, spent 6 hours just trying to fix this one and only bug. this guide really shows POOR screens. anyone have the bug where u make an upgrade from nothing and it doesnt show up when u link the upgrade to the research unit? the very last option when u choose the upgrade. 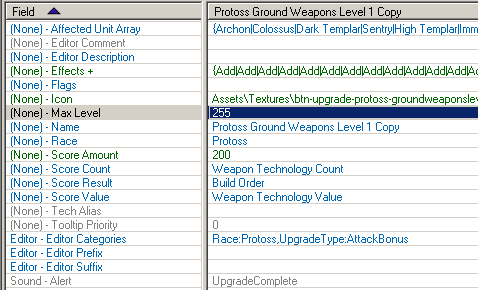 i made it and shows upgrades but doesnt show up in any upgrade options in other parts of the editor, but does show up in the req when u set them. just found out theres a bug with upgrades when copying them. if u copy an upgrade YOU made it will be a FAKE upgrade and will not work. I did this tutorial exactly as it says but still I can't get the cost to accumulate. Anyone had a similiar problem?